From Jack Dempsey to Joe Louis to Evander Holyfield to Wladimir Klitschko – we all have our favorite Heavyweights! At Halstead – ours is the 21770 – 2.9mm Heavy Cable Chain. 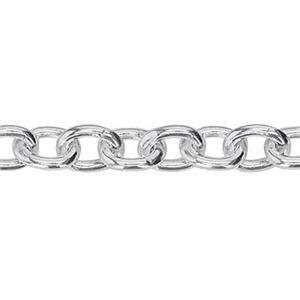 Bright, Sterling Silver, with a chain link inner diameter that will accommodate a 16-gauge jump ring or smaller. It will give you that one-punch knockout to make your jewelry designs a winner! Notes: Chain link inner diameter will accommodate 13ga jump rings or smaller. Bulk chain is priced per inch. All chains are sold in 12 inch minimum quantities unless a 10 foot minimum is noted. We may use segments of 7 inches or longer to fulfill your order if continuous lengths are not available. Spooled lengths are segmented at the factory so we cannot guarantee continuous lengths of any specific measure. Solid, sturdy, clean chain. Great value. This is my favorite chain to use, and my customers love it too. Perfect for medium to heavy pendants. Nice strong chain. It says it is anti tarnish, but I have oxidized it, and it turns out great. I purchased this chain to give it a try and was so happy with what I received! It is what it says it is. It's a very heavy sturdy chain. The links are such that there is plenty of room to add jump rings for charms, or whatever else you would like. It is very versatile. I cannot get over how strong this chain is! It has such a shiny finish on it as well. I will definitely be back for more of this chain. And what a great price!